The United States commemorates the 75th anniversary of the Japanese attack on Pearl Harbor Wednesday. 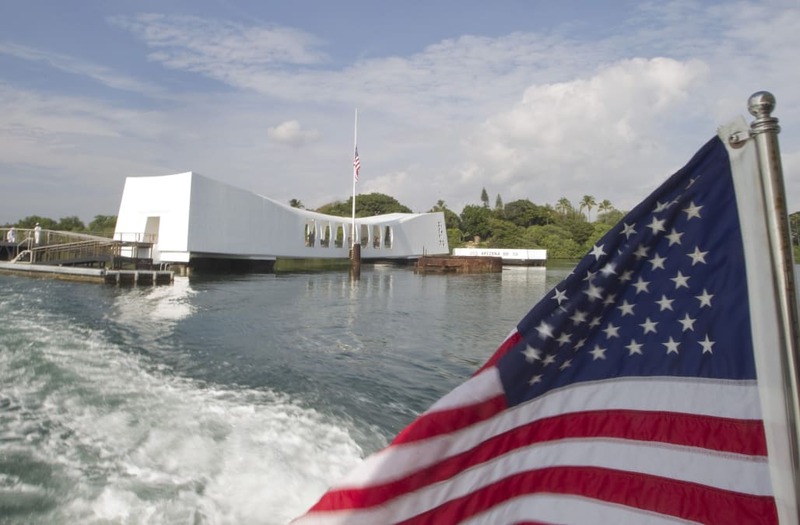 Americans around the nation will commemorate the day with a moment of silence at 7:55 a.m. -- the local time on December 7, 1941 when the first Japanese planes filled the skies over the harbor. On that day, dubbed the "date which will live in infamy" by President Franklin Roosevelt, Japan took aim at Pearl Harbor and six other military bases on the Hawaiian island of Oahu. The attack claimed 2,400 American lives and marked the start of U.S. involvement in World War II. The opening ceremony begins at 12:45 p.m. EST at Kilo Pier, Joint Base Pearl Harbor-Hickam. Events will continue throughout the day at different locations across the island. A Marine rifle squad fires a volley over the bodies of fifteen officers and men killed at Naval Air Station Kanoehe Bay during the raid the previous day at Pearl Harbor, Hawaii, U.S. December 8, 1941. The 75th anniversary of the attack, which brought the United States into World War Two, is marked on December 7, 2016. U.S. Navy/National Archives/Handout via ReutersATTENTION EDITORS - THIS IMAGE WAS PROVIDED BY A THIRD PARTY. EDITORIAL USE ONLY. A model made for a Japanese propaganda film on the Pearl Harbor raid, showing ships located as they were during the December 7, 1941 attack, is seen in a photograph which was brought back to the U.S. from Japan at the end of World War II by Rear Admiral John Shafroth. The 75th anniversary of the attack, which brought the United States into World War Two, is marked on December 7, 2016 U.S. Naval History and Heritage Command/Handout via Reuters ATTENTION EDITORS - THIS IMAGE WAS PROVIDED BY A THIRD PARTY. EDITORIAL USE ONLY. Ship's Chief Petty Officers listen to the radio broadcast of President Franklin D. Roosevelt's address to the Congress requesting a declaration of War against the Axis powers, December 8, 1941. Note the photograph of President Roosevelt on the bulkhead. The 75th anniversary of the attack, which brought the United States into World War Two, is marked on December 7, 2016. U.S. Navy/National Archives/Handout via ReutersATTENTION EDITORS - THIS IMAGE WAS PROVIDED BY A THIRD PARTY. EDITORIAL USE ONLY. A wrecked U.S. Army Air Corps B-17C bomber lies at Hickam Air Field, following the end of the Japanese raid on Pearl Harbor, Hawaii, U.S. December 7, 1941. This plane, piloted by Captain Raymond T. Swenson, was one of those that arrived during the raid after flying in from California. It was hit by a strafing attack after landing and burned in half. The 75th anniversary of the attack, which brought the United States into World War Two, is marked on December 7, 2016. U.S. Navy/National Archives/Handout via Reuters ATTENTION EDITORS - THIS IMAGE WAS PROVIDED BY A THIRD PARTY. EDITORIAL USE ONLY. The body of a sailor killed during the Japanese air attack at Naval Air Station Kanoehe Bay lies on the shoreline, at Pearl Harbor, Hawaii, U.S. December 7, 1941. The 75th anniversary of the attack, which brought the United States into World War Two, is marked on December 7, 2016. U.S. Navy/National Archives/Handout via Reuters ATTENTION EDITORS - THIS IMAGE WAS PROVIDED BY A THIRD PARTY. EDITORIAL USE ONLY. Sailors attempt to save a burning PBY amphibious aircraft at during the Japanese raid on Naval Air Station Kaneohe Bay, Hawaii December 7, 1941. The 75th anniversary of the attack, which brought the United States into World War Two, is marked on December 7, 2016 U.S. Navy/U.S. Naval History and Heritage Command/Handout via Reuters ATTENTION EDITORS - THIS IMAGE WAS PROVIDED BY A THIRD PARTY. EDITORIAL USE ONLY. The destroyers USS Downes and USS Cassin lie wrecked in Drydock One ahead of the battleship USS Pennsylvania soon after the end of the Japanese air attack on Pearl Harbor, Hawaii, U.S. December 7, 1941. The 75th anniversary of the attack, which brought the United States into World War Two, is marked on December 7, 2016. Navy Photographer's Mate Harold Fawcett/U.S. Navy/National Archives/Handout via ReutersATTENTION EDITORS - THIS IMAGE WAS PROVIDED BY A THIRD PARTY. EDITORIAL USE ONLY. The forward superstructure of the sunken battleship USS Arizona burns after the Japanese raid on Pearl Harbor, December 7, 1941. The 75th anniversary of the attack, which brought the United States into World War Two, is marked on December 7, 2016 U.S. Navy/U.S. Naval History and Heritage Command/Handout via Reuters ATTENTION EDITORS - THIS IMAGE WAS PROVIDED BY A THIRD PARTY. EDITORIAL USE ONLY. The destroyers USS Downes and USS Cassin lie wrecked in Drydock One ahead of the battleship USS Pennsylvania soon after the end of the Japanese air attack on Pearl Harbor, Hawaii, U.S. December 7, 1941. The 75th anniversary of the attack, which brought the United States into World War Two, is marked on December 7, 2016. U.S. Navy/National Archives/Handout via ReutersATTENTION EDITORS - THIS IMAGE WAS PROVIDED BY A THIRD PARTY. EDITORIAL USE ONLY. Sailors in a motor launch rescue a survivor from the water alongside the sunken battleship USS West Virginia during or shortly after the Japanese air raid on Pearl Harbor, Hawaii, U.S. December 7, 1941. The 75th anniversary of the attack, which brought the United States into World War Two, is marked on December 7, 2016. U.S. Navy/National Archives/Handout via Reuters ATTENTION EDITORS - THIS IMAGE WAS PROVIDED BY A THIRD PARTY. EDITORIAL USE ONLY. Gunners on board the minesweeper USS Avocet look for more Japanese planes, at about the time the air raid ended on Pearl Harbor, Hawaii, U.S. December 7, 1941. The 75th anniversary of the attack, which brought the United States into World War Two, is marked on December 7, 2016. U.S. Navy/National Archives/Handout via Reuters ATTENTION EDITORS - THIS IMAGE WAS PROVIDED BY A THIRD PARTY. EDITORIAL USE ONLY. A Japanese Type 00 (Zero) fighter with markings from the carrier Akagi is seen after it crashed during the attack at Fort Kamehameha, near Pearl Harbor, Hawaii, U.S. December 7, 1941. The 75th anniversary of the attack, which brought the United States into World War Two, is marked on December 7, 2016. U.S. Navy/National Archives/Handout via ReutersATTENTION EDITORS - THIS IMAGE WAS PROVIDED BY A THIRD PARTY. EDITORIAL USE ONLY. U.S. Marines await the possible return of Japanese aircraft on the parade ground at the Pearl Harbor Marine Barracks, Hawaii, U.S. December 7, 1941. The 75th anniversary of the attack, which brought the United States into World War Two, is marked on December 7, 2016. U.S. Naval History and Heritage Command/Handout via Reuters ATTENTION EDITORS - THIS IMAGE WAS PROVIDED BY A THIRD PARTY. EDITORIAL USE ONLY. The crew of the Japanese carrier Shokaku cry Banzai as a Type 97 Kate carrier attack plane takes off as the second wave attack is launched on Pearl Harbor, Hawaii, U.S. December 7, 1941. The 75th anniversary of the attack, which brought the United States into World War Two, is marked on December 7, 2016. U.S. Navy/National Archives/Handout via ReutersATTENTION EDITORS - THIS IMAGE WAS PROVIDED BY A THIRD PARTY. EDITORIAL USE ONLY. A Japanese Type 00 (Zero) carrier fighter trails smoke after it was hit by anti-aircraft fire during the attack on Pearl Harbor, Hawaii, U.S. December 7, 1941. The 75th anniversary of the attack, which brought the United States into World War Two, is marked on December 7, 2016. U.S. Navy/National Archives/Handout via Reuters ATTENTION EDITORS - THIS IMAGE WAS PROVIDED BY A THIRD PARTY. EDITORIAL USE ONLY. Flak bursts of anti-aircraft shells pepper the skyline above rising smoke from the battleship USS Arizona during the Japanese raid on Pearl Harbor, Hawaii, U.S. December 7, 1941. The 75th anniversary of the attack, which brought the United States into World War Two, is marked on December 7, 2016. U.S. Navy/National Archives/Handout via Reuters ATTENTION EDITORS - THIS IMAGE WAS PROVIDED BY A THIRD PARTY. EDITORIAL USE ONLY. The damaged battleship USS California, listing to port after being hit by Japanese aerial torpedoes and bombs, is seen off Ford Island during the attack on Pearl Harbor, Hawaii, U.S. December 7, 1941. The 75th anniversary of the attack, which brought the United States into World War Two, is marked on December 7, 2016. U.S. Navy/National Archives/Handout via Reuters ATTENTION EDITORS - THIS IMAGE WAS PROVIDED BY A THIRD PARTY. EDITORIAL USE ONLY. A Japanese Navy Type 99 Val carrier bomber is seen in action during the attack on Pearl Harbor, Hawaii, U.S. December 7, 1941. The 75th anniversary of the attack, which brought the United States into World War Two, is marked on December 7, 2016. U.S. Navy/National Archives/Handout via Reuters ATTENTION EDITORS - THIS IMAGE WAS PROVIDED BY A THIRD PARTY. EDITORIAL USE ONLY. The battleship USS Arizona burns on Battleship Row, beside Ford Island in an aerial photo taken from a Japanese aircraft during the attack on Pearl Harbor, Hawaii, U.S. December 7, 1941. Ships seen are (L-R) USS Nevada, USS Arizona with USS Vestal moored outboard, USS Tennessee with USS West Virginia moored outboard and USS Maryland with USS Oklahoma capsized alongside. The 75th anniversary of the attack, which brought the United States into World War Two, is marked on December 7, 2016 U.S. Naval History and Heritage Command/Handout via Reuters ATTENTION EDITORS - THIS IMAGE WAS PROVIDED BY A THIRD PARTY. EDITORIAL USE ONLY. Sailors stand amid wrecked planes at the Ford Island seaplane base, watching as the destroyer USS Shaw explodes in the center background during the Japanese attack on Pearl Harbor, Hawaii, U.S. December 7, 1941. The 75th anniversary of the attack, which brought the United States into World War Two, is marked on December 7, 2016. U.S. Navy/National Archives/Handout via Reuters ATTENTION EDITORS - THIS IMAGE WAS PROVIDED BY A THIRD PARTY. EDITORIAL USE ONLY. The forward magazines of the destroyer USS Shaw explode after a bombing attack by Japanese planes on Pearl Harbor, Hawaii, U.S. December 7, 1941. The 75th anniversary of the attack, which brought the United States into World War Two, is marked on December 7, 2016 U.S. Navy/U.S. Naval History and Heritage Command/Handout via Reuters ATTENTION EDITORS - THIS IMAGE WAS PROVIDED BY A THIRD PARTY. EDITORIAL USE ONLY. The forward magazine of the destroyer USS Shaw explodes during the second Japanese attack wave on Pearl Harbor, Hawaii, U.S. December 7, 1941. The 75th anniversary of the attack, which brought the United States into World War Two, is marked on December 7, 2016 U.S. Naval History and Heritage Command/Handout via Reuters ATTENTION EDITORS - THIS IMAGE WAS PROVIDED BY A THIRD PARTY. EDITORIAL USE ONLY. A Japanese bomber aircraft is seen in the foreground of an aerial photograph taken by a Japanese pilot during the attack on Pearl Harbor, Hawaii, U.S. December 7, 1941. The 75th anniversary of the attack, which brought the United States into World War Two, is marked on December 7, 2016. US Navy/NEA Services/Handout via ReutersATTENTION EDITORS - THIS IMAGE WAS PROVIDED BY A THIRD PARTY. EDITORIAL USE ONLY. An officer on the Japanese aircraft carrier Shokaku watches as planes take off to attack Pearl Harbor, Hawaii, U.S. December 7, 1941. The Kanji inscription at left is a commander order to pilots to do their duty to destroy (the enemy). The 75th anniversary of the attack, which brought the United States into World War Two, is marked on December 7, 2016. U.S. Navy/National Archives/Handout via Reuters ATTENTION EDITORS - THIS IMAGE WAS PROVIDED BY A THIRD PARTY. EDITORIAL USE ONLY. A Japanese Navy Type 97 Kate carrier attack plane takes off from the aircraft carrier Shokaku, en route to attack Pearl Harbor, Hawaii, U.S. December 7, 1941. The 75th anniversary of the attack, which brought the United States into World War Two, is marked on December 7, 2016. U.S. Navy/National Archives/Handout via Reuters ATTENTION EDITORS - THIS IMAGE WAS PROVIDED BY A THIRD PARTY. EDITORIAL USE ONLY. A chart identifying ship mooring locations and entitled (at upper left) "Report on positions of enemy fleet at anchorage", is seen after it was recovered from a Japanese aircraft that was downed during the attack on Pearl Harbor, Hawaii, U.S. December 7, 1941. The 75th anniversary of the attack, which brought the United States into World War Two, is marked on December 7, 2016. US Navy/National Archives/Handout via Reuters ATTENTION EDITORS - THIS IMAGE WAS PROVIDED BY A THIRD PARTY. EDITORIAL USE ONLY. Japanese Navy Type 99 Val carrier bombers prepare to take off from an aircraft carrier to attack Pearl Harbor, Hawaii, U.S. December 7, 1941. The ship in the background is the carrier Soryu. The 75th anniversary of the attack, which brought the United States into World War Two, is marked on December 7, 2016. U.S. Navy/National Archives/Handout via Reuters ATTENTION EDITORS - THIS IMAGE WAS PROVIDED BY A THIRD PARTY. EDITORIAL USE ONLY. An aerial photograph taken the year before the Japanese raid shows the East Loch and the the Fleet Air Base on Ford Island in Pearl Harbor, Hawaii, U.S. May 3, 1940. Visible are the carrier Yorktown, ten battleships, seventeen cruisers, two light cruisers, and over thirty destroyers. The 75th anniversary of the attack, which brought the United States into World War Two, is marked on December 7, 2016. U.S. Navy/National Archives/Handout via Reuters ATTENTION EDITORS - THIS IMAGE WAS PROVIDED BY A THIRD PARTY. EDITORIAL USE ONLY. National Pearl Harbor Remembrance Day Commemoration: 7:45 a.m. HST (12:45 p.m. EST) to 9:15 a.m. HST (2.15 p.m. EST) at Kilo Pier, Joint Base Pearl Harbor-Hickam.